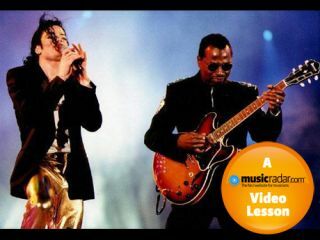 Michael Jackson was renowned for employing some of the best guitarists of their day, be it Larry Carlton, Steve Stevens, Eddie Van Halen or Orianthi. One player who made an indelible mark on Jackson recordings was David Williams. He performed on the Off The Wall, Thriller, Triumph, Victory, Bad and Dangerous albums - some of the most successful albums in recorded history. Jackson was even quoted as saying "I can hardly work without you." The superb funk playing on Billie Jean is one of Williams' most recognisable contributions to the MJ catalogue. Williams himself sadly died earlier in 2009, but here's an archive video lesson from MusicRadar's sister magazine Guitar Techniques which demonstrates his talent. With funk guitar, it's important that the guitar tone is crisp and focused. Using his Ibanez Strat type guitar (with humbucker mode selected), David opted to use his Dunlop wah plugged into a PODXT set to a Blackface (Fender Twin) and a Vox AC30. David played with numerous big names (Chaka Khan, Jackson 5, Bryan Ferry and Roxy Music) but the best albums to check out are Michael Jackson's Off The Wall (1979), Thriller (1982) and Bad (1987) albums. You may also like to check out his sparkling rhythm work on Madonna's Who's That Girl (1987) and Like A Prayer (1989). It's also David that played the riff part on Steely Dan's song FM. A 12/8 time signature can be an exciting groove to work with so no wonder countless blues songs use it and a substantial number of funk tunes (eg, Higher Ground) too! Using his guitar's neck pickup and some wah work, Dave uses predominantly down strokes to add weight to his feel. As a four bar pattern, the tab here shows the main elements of his part (working out of G minor petantonic shape 1, sliding into a minor V chord to finish the phrase) but don't be frightened to add small variations to it as he does. After recording the wah part Dave came up with this on his second take - he was explicit in saying he was looking to ignore the wah part so he didn't end up duplicating it. Again, it works within G minor pentatonic shape 1 at the 3rd fret but this time he's opted for a two bar idea which adds tasty syncopation to the back end of each bar, pushing the groove on. After playing two parts that locked together, Dave came up with this third and final part. "Playing whole note chords over the more intense rhythmic parts glues it all together and would make it easier to write to if a singer or producer was involved." Look what he's done - higher notes than previously make up the sustained chords so they don't muddy up the arrangement and in bar 3 he's added a little soul sophistication delaying the resolution to Gm7 via the F/G. Tasty stuff. While the first guitar part worked its magic mainly in the first of each two bars, guitar two works with A minor pentatonic ideas in each second bar. Watch those G notes in the first and third bars - minimal to play, but can be tricky to place right. Welcome to quality funk playing! For Dave's last groove, he opted for a busy drum pattern to work with. And look what he does - a few well placed power chords so he doesn't compete with the drums. 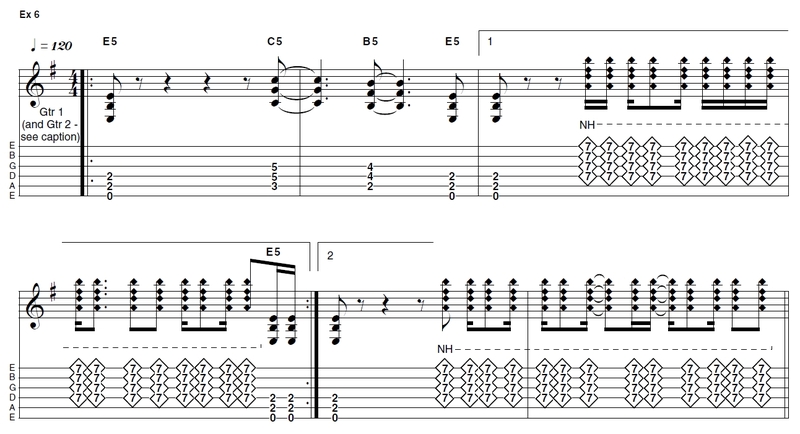 This is pretty funky but he closes the four bar pattern with some syncopated harmonic strums at the 7th fret. Take your time with these as the rhythms aren't as easy as you may think. Guitar two is virtually a direct copy so when each is panned hard left and right a wide stereo part is created. Being able to double a part well is an imperative studio skill you'd be wise to develop. Dave wanted to add a harder edge to the main doubled part so he played this. Using palm muting and a few subtle accents, the relentless E5 chord adds a little tension to the louder C5 and B5 powerchords and an ominous 'bed' part for the loose harmonic strums. Inspired, eh?